Saturday was a return to racing after a lengthy gap. However, a glorious sunny day with Force 2-3 beckoned and the fleets were busy rigging in the dinghy park. 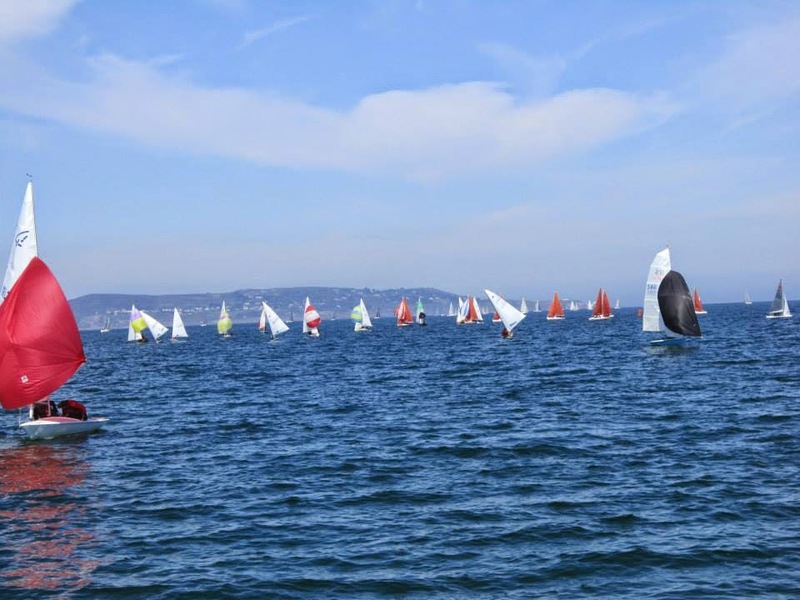 Multiple Lasers and one RS400 were the OK Dinghy’s competition on the day and with Windward-Leeward courses selected by the committee it was likely that the single handers would come out best. The RS400 prefers triangles and despite solid sailing they couldn’t feature in the final mix. In the end the OK Dinghy came out top on the day. In Race 1 it beat all the Lasers not only on handicap but also head-to-head on the water. In Race 2 just one Laser beat the OK Dinghy on the water, but only by about 20 seconds, leaving the OK winning the race on corrected time. Two races and two wins is always nice. It was nice to beat the Lasers boat for boat too. Race 1 was primarily a battle of boatspeed. With waves of pressure coming across the course, but little change in wind direction, the battle was to exploit every puff and to keep the boat moving through every lull. The OK Dinghy got a decent start mid line and stuck close to Paul Keane in the leading Laser up the first beat and down the first run. A slow Fifteen provided some interest at the leeward mark, mixing itself in with the leading groups of several races, including ours. Other than that, it’s fascinating to see how the GPS tracks show the effect of the gusts and lulls, with boats speeding and slowing dramatically. Keane led around the first lap with the OK in close pursuit, but the second beat was the most interesting. Swapping tacks up the 2nd beat, the OK Dinghy finally got some better luck near the windward mark and got inside a group of Fifteens and Fireballs – and Keane’s Laser – at the mark. Then the 2nd run saw Keane and the OK split sides and the OK Dinghy got a lucky little puff near the leeward mark to bring it home clear ahead. Race 2 was a different affair, with shifts dominating even more than the changes in windspeed. The race had also been joined by some additional Lasers, with Nesbitt and Harding the most notable contenders. After a weak start the OK Dinghy had to look around for an escape clause and saw wind on the left. A quick hike out that side was enough to allow the OK to sail right over the top of the group of Lasers and lead around the windward mark…although it only barely made it before a wave of pressure came in from the right and the Lasers weren’t far behind at the mark. After holding the lead on the run the OK Dinghy had to go right after the leeward mark and was horrified to see a repeat of the first beat – with new wind and a 20 degree shift on the left. Worse, Richard Harding was about to take full advantage of it, blasting straight up the beat with good speed. The OK Dinghy baled out of the right, sailing back across the course to get to the new wind. Harding’s Laser was now just ahead. Both swapped tacks and worked back across to the right where the wind was filling back in from the right. By the windward mark these two were hundreds of metres clear of the fleet and separated by only a few metres. Harding held the lead all the way to the finish despite the best efforts of the OK Dinghy. Keane and the other Lasers were far back. Here are the same races, but with the boatspeeds and directions. It’s interesting to see the gusts come across the fleet.